An airliner is a type of aircraft for transporting passengers and air cargo. Such aircraft are most often operated by airlines. Although the definition of an airliner can vary from country to country, an airliner is typically defined as an aeroplane intended for carrying multiple passengers or cargo in commercial service. 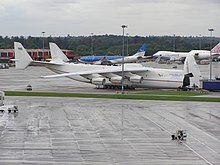 The largest of them are wide-body jets which are called also twin-aisle because they generally have two separate aisles running from the front to the back of the passenger cabin. These are usually used for long-haul flights between airline hubs and major cities. 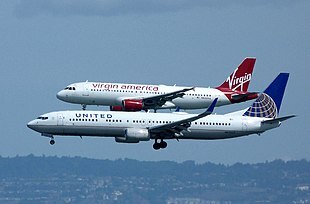 A smaller, more common class of airliners is the narrow-body or single-aisle. These are generally used for short to medium-distance flights with fewer passengers than their wide-body counterparts. The lightest (light aircraft, list of light transport aircraft) of short-haul regional feeder airliner type aircraft that carry a small number of passengers are called commuter aircraft, commuterliners, feederliners, and air taxis, depending on their size, engines, how they are marketed, region of the world, and seating configurations. The Beechcraft 1900, for example, has only 19 seats. 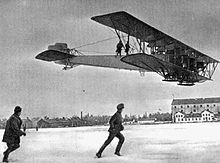 In 1913, Igor Sikorsky developed the first large multi-engine airplane, the Russky Vityaz, refined into the more practical Ilya Muromets with dual controls for a pilot plus copilot and a comfortable cabin with a lavatory, cabin heating and lighting. The large four-engine biplane was derived in a bomber aircraft, preceding subsequent transport and bomber aircraft. Due to the onset of World War I, it was never used as a commercial airliner. It first flew on December 10, 1913 and took off for its first demonstration flight with 16 passengers aboard on February 25, 1914. The world's first all-metal transport aircraft was the Junkers F.13, also from 1919, with 322 built. The Dutch Fokker company produced the Fokker F.II and then the F.III. These aircraft were used by the Dutch airline KLM when it reopened[further explanation needed] an Amsterdam-London service in 1921. The Fokkers were soon flying to destinations across Europe, including Bremen, Brussels, Hamburg, and Paris. They proved to be very reliable aircraft. In Britain, the de Havilland Dragon was a successful aircraft during the 1930s. Its simple design used a plywood box fuselage. It could carry six passengers, each with 45 pounds (20 kg) of luggage, on the London-Paris route on a fuel consumption of just 13 gal (49 l) per hour. 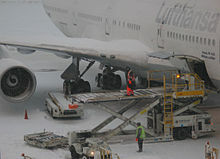 The wing panels outboard of the engines could be folded for storage. 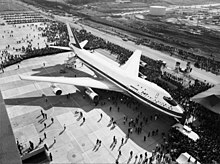 The type was attractive as a short-haul, low-capacity airliner and was soon in service worldwide. British production of the DH.84[further explanation needed] ended when it was replaced on the assembly line by the more powerful and elegant de Havilland Dragon Rapide. The Type II process was complicated by the proposition of Vickers that a move to the newly developed turboprop power should be made. The specification was, therefore, split in two, with the conventional piston design going to the eventual de Havilland Dove and Airspeed Ambassador. The revolutionary VC.2 Viceroy, first flown in 1948, was the first turboprop design anywhere. The Type III requirement was developed as the Avro Tudor. Between 2018 and 2037, Boeing forecasts 42,730 deliveries for $6,350 billion : 2,320 Regional jets for $110 billion, 31,360 single-aisles for $3,480 billion and 9,050 Widebodies for $2,760 billion including freighters. Flightglobal predicts 46,460 deliveries between 2018 and 2037, 65% single-aisles, worth $3.1 trillion including $1.29 for twin-aisles: Asia-Pacific 23%, North America 20%, China 19%, Europe 16%, Latin America 8%, Middle East 7%, Russia 4% and Africa 3%. Deloitte anticipates 38,000 deliveries over two decades, including 7,690 worth US$1.2 trillion in China, 2,990 valued at US$660 billion in Middle East and 2,000 in India. The overhead bins are used for stowing carry-on baggage and other items. While the airliner manufacturer will normally specify a standard version of the product to supply, airlines can choose to have bins of differing size, shape, or color installed. Over time, overhead bins evolved out of what were originally overhead shelves that were used for little more than coat and briefcase storage. As concerns about falling debris during turbulence or in accidents increased, enclosed bins became[when?] the norm. Bins have increased in size to accommodate the larger carry-on baggage passengers can bring onto the aircraft. Newer bin designs have included a handrail, useful when moving through the cabin. ^ Tise, Larry E. Conquering the Sky. New York: Palgrave MacMillan, 2009. Print. ^ Bernardo, James V. Aviation and Space: In the Modern World. New York: E.P. Dutton. 1968. ^ Richard P. Hallion (July 2008). "Airplanes that Transformed Aviation". Air & space magazine. Smithsonian. ^ a b Jackson 1973, p.62. ^ Jackson 1988, p. 202. ^ Chavis, Jason C. (19 May 2011). Patsalides, Laurie, ed. "From Civilian to Military: All About 1920 Airplanes". Brighthub.com. Retrieved 18 March 2013. ^ "World Airliners 1913 to 1939". Scribd.com. 31 March 2010. Retrieved 18 March 2013. ^ Mellberg, William F (2003). "TRANSPORTATION REVOLUTION". Mechanical Engineering. 125: 22–25. ^ a b c d e Jarrett, Phillip. eds. Modern Air Transport: Worldwide Air Transport from 1945 to the Present. London: Putnam, 2000. ^ Hamilton-Paterson, James (2010). Empire of the Clouds: When Britain's Aircraft Ruled the World (1St edition reprint ed.). Faber & Faber. p. 304. ISBN 0571247946. ^ Kroo, Ilan (January 19, 2006). "Engine Placement" (PDF). AA241 Introduction to Aircraft Design: Synthesis and Analysis. Stanford University. Retrieved February 12, 2012. ^ "Blended Wing Body Feature". NASA. 17 April 2013. Retrieved 18 January 2016. ^ Kingsley-Jones, Max. "6,000 and counting for Boeing’s popular little twinjet." Flight International, Reed Business Information, April 22, 2009. Retrieved April 22, 2009. ^ Craig Hoyle (6 Nov 2018). "World airliner directory - Mainliners". Flight Global. ^ Addison Schonland (March 27, 2018). "Some big picture thoughts". AirInsight. ^ a b c Antoine Fafard (18 Sep 2018). "Commercial fleet summary September 2018". FlightGlobal. ^ a b "787 stars in annual airliner census". FlightGlobal. 14 August 2017. ^ a b "FlightGlobal airliner census reveals fleet developments". FlightGlobal. 8 August 2016. ^ Richard Aboulafia (Sep 22, 2017). "Opinion: Have Jetliners Escaped The Boom-Bust Cycle?". Aviation Week & Space Technology. ^ Richard Aboulafia (Dec 22, 2017). "Opinion: The Great Jetliner Ramp-up In Perspective". Aviation Week & Space Technology. ^ a b "Fleet Watch 2017: commercial aircraft orders and deliveries for 2016". FlightGlobal. 7 March 2017. ^ "Aircraft manufacturers embrace the consumer society's values of built-in obsolescence". CAPA center for aviation. 20 Jun 2017. ^ IBA Consultants (Aug 1, 2018). "So how successful was Farnborough International Airshow 2018?". Aircraft Interiors. ^ "Global Market Forecast 2018-2037". Airbus. ^ Ray Jaworowski (July 18, 2018). "More than 29,000 Large Jetliners to be Built over 15 Years". Forecast International. ^ "Boeing Forecasts $15 Trillion Commercial Airplanes and Services Market" (Press release). Boeing. July 17, 2018. ^ "2018–2037 Flight Fleet Forecast Executive Summary". FlightGlobal. July 2018. ^ "2019 global aerospace and defense industry outlook" (PDF). Deloitte. December 2018. ^ Sean Broderick (Jun 13, 2018). "Aircraft Returning From Storage Reaches Four-Year High". Aviation Week Network. ^ "Civil Aviation Safety Authority – Seating information". Australian Government Civil Aviation Safety Authority. Archived from the original on 3 March 2009. Retrieved 18 March 2013. Newhouse, John (1982). The Sporty Game: The High-Risk Competitive Business of Making and Selling Commercial Airliners. New York: Alfred A. Knopf. ISBN 978-0-394-51447-5. "An Overview of Commercial Aircraft 2017 - 2018" (PDF). DVB Bank. October 2016. This page was last edited on 15 April 2019, at 07:15 (UTC).